This is another great example of why I love the Daring Cooks’ and Bakers’ Challenges. It’s all about taking yourself out of your box – making something you wouldn’t ordinarily make. Maybe this “something” seems too difficult. Maybe it seems as though it will take too long, or maybe it’s been on your list of “things to do”, but you haven’t gotten around to making it yet. I never tried to make pierogies before this challenge. Not because of the reasons mentioned above. Honestly, I never even tried eating them before either. They didn’t sound unappetizing, of course, but they weren’t on the top of my list of things to try. I didn’t know what to expect with this challenge because of my lack of experience with pierogies, so I was a bit nervous. But after brainstorming on fillings (I chose to make sweet potato and rosemary, as I had a bunch of rosemary in my garden, and smoked pork shoulder and mashed potato, as I smoked a bunch of meat a few days prior), I figured I’d give them a try. Little did I know how well they’d turn out. My husband raved about them. Raved. He exclaimed that he could imagine these could be served at all sorts of parties and could see them being a big hit with a crowd. I didn’t disagree – and the ones I made were gobbled up by the two of us that evening. I can see endless variations of fillings for these things, both sweet and savory. Needless to say, I underestimated pierogies. Now, I’m sold. Mix together all ingredients and season to taste. 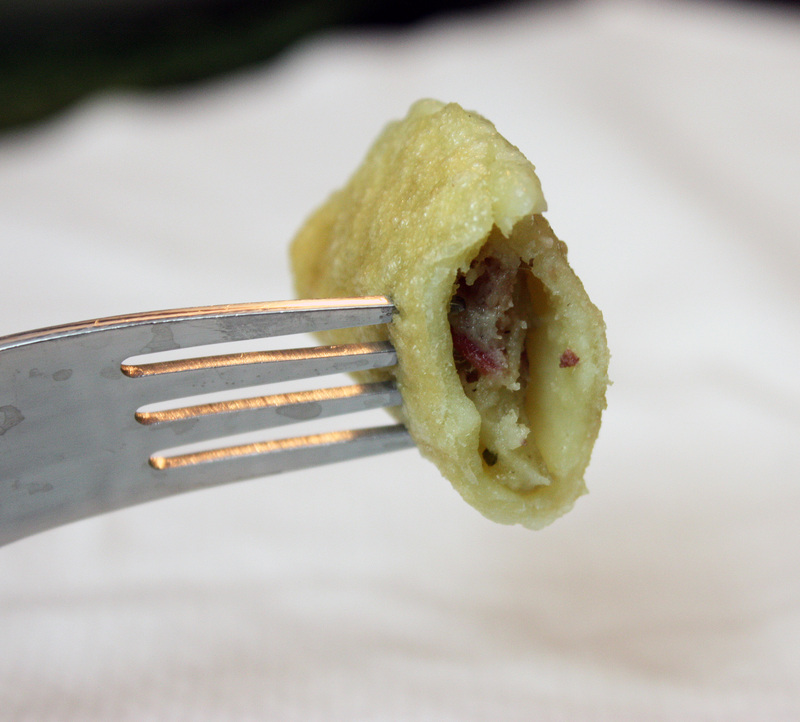 Fill pierogies with filling. Combine flours, salt, and xanthan gum in a medium bowl. 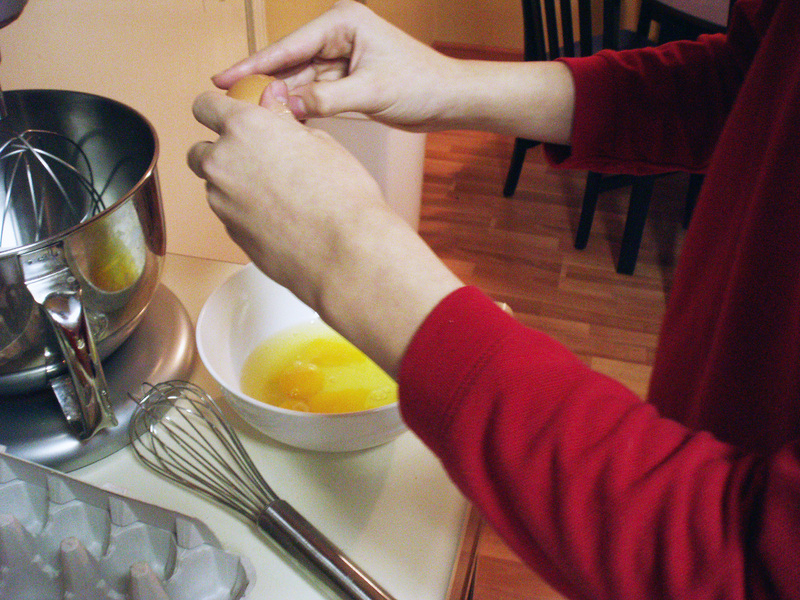 Whisk eggs in a separate bowl, and then whisk in oil. Pour wet ingredients into dry and stir until combined. You can then knead this into a ball. To cook pierogies, bring a pot full of salted water to a boil. Lower the pierogies into the boiling water with a slotted spoon and allow to boil for 10-15 minutes or until al dente. Remove with a slotted spoon. 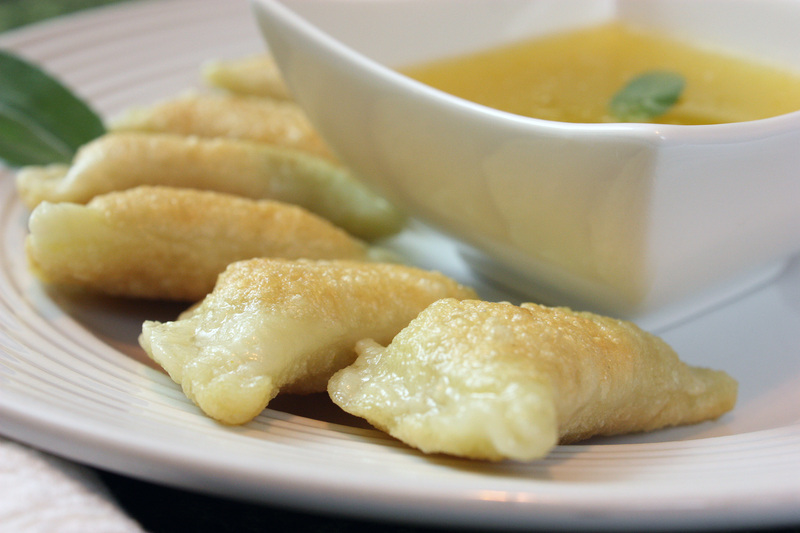 Serve with desired sauce or melted butter, or allow to cool to room temperature for frying. Matt loves pasta. Spaghetti, lasagna, and macaroni and cheese? These three dishes alone could make this boy happy for a long, long time. Italy was his country of choice this time around, which, naturally, pleased Matt. We discussed various Italian dishes, both pasta and non-pasta, but the mention of bacon and spaghetti – two of his favorite things in the world – made spaghetti carbonara the choice for dinner tonight. 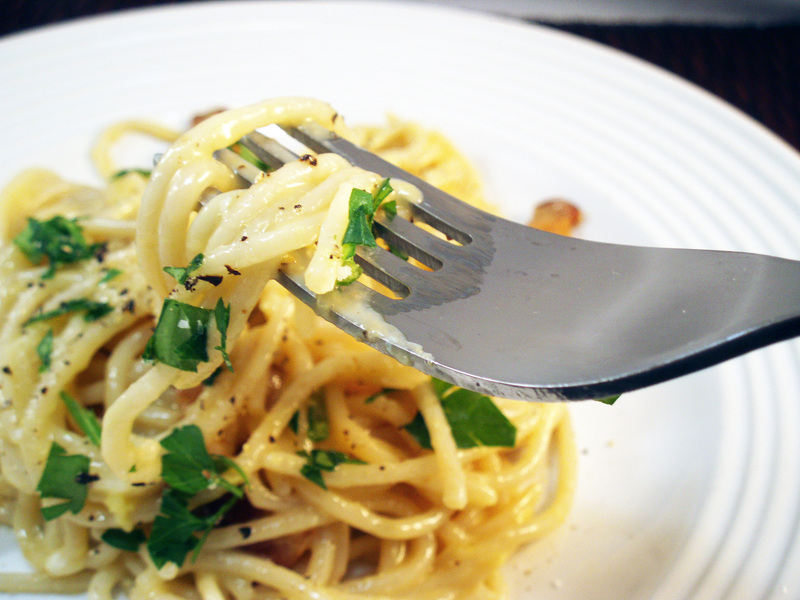 Truth be told, spaghetti carbonara is not among my favorite Italian dishes. It’s a bit on the rich and heavy side, in my opinion. As this was the case, I have not made spaghetti carbonara prior to this evening. Nevertheless, I sought out a recipe that was sure to please. Emeril saved the day! (Every Emeril Lagasse recipe I have followed has turned out beautifully!) I followed the original recipe pretty closely – it’s relatively straightforward and simple – and it was pretty darn tasty, if I do say so. Not one piece of shell was dropped in the eggs! Matt enjoyed it a great deal. Of course, eggs, bacon, cheese, and spaghetti – what’s not to like? In a large saute pan over medium heat, fry the bacon until crispy. Remove bacon with slotted spoon or spatula and allow to drain on paper towels. Remove all but 3 tablespoons of the bacon fat from the pan. Add garlic and saute for 30 seconds, and season with pepper. Add back the bacon and pasta and saute for 1 minute. Season the eggs with salt. Remove the pan from heat and add eggs, stirring quickly, until eggs thicken but do not scramble. Add the cheese and taste; adjust seasoning as needed with salt and pepper. Garnish with parsley. Serves 4 generously. Earlier this year, during a little visit to Local Harvest, I stumbled upon a local farm. This farm happened to be relatively close to my house, and they offered farm fresh eggs. Curious, I contacted Cindy Telisak at Jacob’s Reward Farm. Little did I know that over the coming months, I would gain so much. Not only have we enjoyed a wonderful bounty of the freshest of eggs, but I gained a friend and a new level of appreciation for the hard work and devotion of our local farmers. Cindy and her family own Jacob’s Reward Farm, a small farm north of Dallas, where they raise sheep, alpacas, and chickens. Over the past few months, I’ve regularly visited Cindy to pick up fresh eggs from her farm, during which we have been well-acquainted. Last weekend, I was honored to cater to her “Spinning Yarns: Cowboy Stories and Song” event. So this month, when I submitted an idea to conduct an interview with Cindy as part of a Foodbuzz 24, 24, 24 event, I was ecstatic to find out that my idea was selected. Cindy has been an inspiration to me, and has been a key influence in my decision to actively support local farmers whenever possible. Alta: How did Jacob’s Reward Farm get its start? Cindy: “Jacob’s Reward” got its start before I even left the suburban life in Plano. I’ve always loved sheep and longed for a homesteading lifestyle, but for many years we had to tough it out in the composite-roof-privacy-fence jungle. In order to get as close as I could to the shepherd’s life, I learned to knit, crochet and spin, and I struck a friendship with a local couple who raise Jacob sheep. I lived the life vicariously through them for several years. When the opportunity arose to buy 4.5 acres here in Parker, we jumped at it. And though there have been many significant challenges, we’ve not looked back. The name “Jacob’s Reward” refers to the story in Genesis when God blessed Jacob with vast herds of sheep and goats as a reward for his years of faithfulness. Alta: What made you decide that raising sheep, alpacas, and chickens was your calling? Cindy: I love animals and have always thought a farm would be a dream come true. Once I learned to knit and spin, it only made sense to raise my own fiber animals. Chickens and fresh eggs are integral to a farm, and they contribute to a healthy diet. And chickens are really fun to watch! Alta: Tell me about a typical day at Jacob’s Reward Farm. Cindy: I am not a morning person, so I have my animals trained not to expect their breakfast at the crack of dawn. But my usual round of chores takes about 45 minutes, depending on the weather. Muddy conditions make everything more complicated. I give a little grain to the eight sheep on the north end of the property, and hay. The front yard chickens are released from their coop to wander the property in search of bugs, seeds and various greens. I feed Smokey the barn cat so that she’s fortified for a day of rodent patrol. On the south side of the property, I feed my six alpacas and two Jacob sheep, and release three other sets of chickens. I top off all the water buckets and fill the hay feeders. I do a similar set of chores morning and evening, ending with locking up the free-range chickens in their coops every night to protect them from predators. Between sets of chores, I take care of my house and my family, teach classes in my studio, and keep up with my farm supporters on my blog, website, podcast, newsletter and other social media. I also try to squeeze in some knitting and spinning of my own. There’s never a dull moment. Alta: Tell me about your chickens. Cindy: I have a handful of breeds of chickens that I have raised from day old chicks. Right now, the flock numbers around 37 total, though 15 of those are just babies. Alta: Why are free-range, farm-raised chickens so much better than even the premium eggs you can purchase at the grocery? Cindy: “Free-range” is a buzz word that may or may not mean what the consumer thinks. It may mean that your pricey grocery store eggs came from chickens who can see outside, or who have access to a tiny concrete slab outside. My free range chickens do just that. I let them out in the morning and they have complete freedom to roam the property, resting in the shade of the native landscape plantings or sunning themselves in the herbicide-free lawns. They gather their own food, following the instinctive promptings God gave them. I do supplement them with commercial grain to round out their diet. My eggs don’t sit very long once they’re laid, either. (Alta’s note: there have been times I’ve arrived and helped Cindy gather a few eggs to fill my dozen – eggs laid just hours earlier. Now that’s fresh!) No telling how old those grocery store eggs are! Alta: Jacob’s Reward Farm has a new Fiber CSA. Could you tell me a little about this? Alta: What has been your biggest hurdle to overcome here at the farm? Cindy: One hurdle we haven’t encountered is lack of interest in what we’re doing. The response has been fantastic. There are vibrant knitting and spinning communities in this area who find my fiber irresistible, and I have more egg customers than I can handle at some times of the year. But since this is my first farming experience, I am learning a lot, and I’m learning every day. The jobs around here are so varied that there is no excuse for being bored. The farm also sits on the banks of Maxwell Creek, and heavy rains sometimes bring the water level a little closer to the house than we’d like. But that hasn’t stopped us. I’m continually working on ways to deal with lots of water on the place. The farm is hard work, but it’s the kind of hard work that gives us a delicious, bone-weary sense of satisfaction at the end of the day. Cindy’s undying optimism, drive, and determination have allowed her to influence a great number of people, including our family. Our kids have loved visiting the chickens, sheep, and alpacas. I’ve enjoyed learning so much about farm life from Cindy, and visiting the farm has brought me a sense of connectedness with the Earth and the changing of seasons. Of course, making the side trip to pick up eggs at Jacob’s Reward Farm rather than just picking them up at the grocery does take extra time and planning. Depending on the weather and the season, the supply fluctuates. But for us, it’s well worth it. We trade convenience for a lot of worthwhile benefits. Not only are the eggs are fresher, tastier, and better for us, we are choosing to support our local farmers – farmers who practice ethical and sustainable treatment of their animals. In an effort to celebrate the fresh eggs we’ve received from Jacob’s Reward Farm, I planned a Farm Fresh Egg-Stravaganza dinner for my family. Each dish was carefully planned, so that I could highlight the eggs throughout the entire meal. The meal began with a small appetizer: Chinese Tea Eggs. These eggs, a typical dish for Chinese New Year, were steeped for 5 hours in a black tea, soy sauce (tamari, actually, so they were gluten-free), cinnamon, star anise, Sichuan peppercorns, and dried orange peel. They were gorgeous to peel, and a tasty first bite. I’ll definitely make these again. 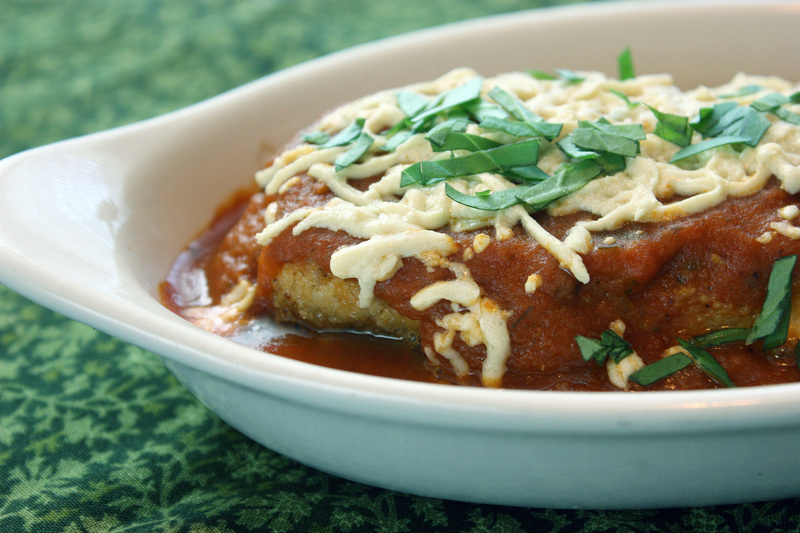 For the recipe, visit Steamy Kitchen’s beautiful blog. The second course? Gluten-Free Egg and Pancetta Tarts. I found a lovely tart crust recipe from The Gluten-Free Almond Flour Cookbook, a new cookbook from Elana Amsterdam of Elana’s Pantry. The crust was a mixture of almond flour, grapeseed oil, salt, agave nectar, and baking soda. Easy as pie tart! I pre-baked mini-tarts for 8 minutes, and then filled them with scrambled eggs, tomato sauce, sauteed pancetta, and shredded white cheddar, and baked them until the cheese was melted and bubbly. These tarts were tasty, although next time, I think I may add some herbs to the tart crust (Elana has an herbed tart crust recipe in her cookbook as well), which would work to increase the savory taste of the tart. Preheat the oven to 350 degrees. Divide tart dough into 4 balls, pressing one ball into each tart pan. Bake for 7-10 minutes or until golden. Remove and let cool slightly. Meanwhile, bring a large saute pan to medium heat. Add pancetta and saute for about 5 minutes, stirring occasionally, until pancetta is crisp. Remove and set aside. Add the olive oil to the pan and turn the heat to medium-low. Whisk the eggs and milk together, and pour into pan. Whisk occasionally, and allow to cook until eggs are just set. (Don’t cook all the way – you don’t want the eggs to dry out.) Season with salt and pepper and remove from heat. To assemble the tarts: With a spoon, spread a little of the tomato sauce into each tart crust. Top with eggs, and sprinkle cheese and pancetta over. Place in the oven for 5-7 minutes, or until cheese is melted and bubbly. 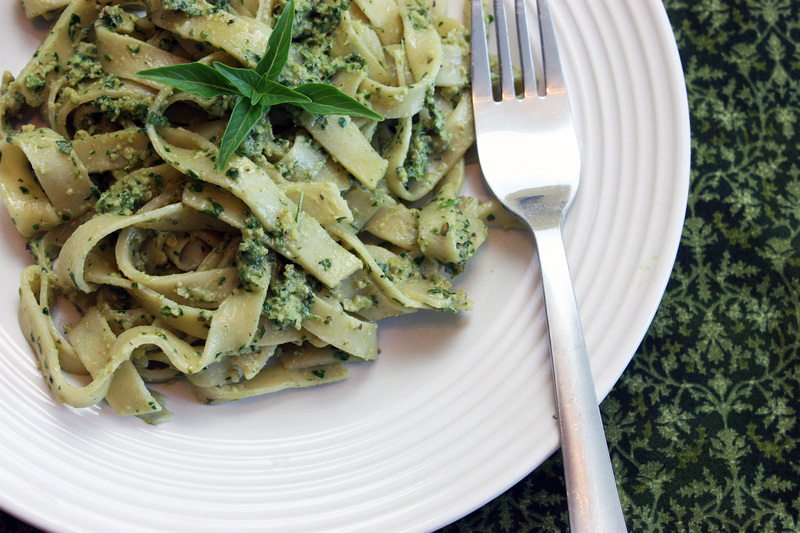 Sprinkle parsley on top as garnish. The third course was the most “daring” for me to attempt – Soft Egg Gluten-Free Ravioli. Until yesterday, I had never made handmade pasta, much less gluten-free handmade pasta. I found a pasta recipe from Living Without that sounded promising, so I set out to make my own ravioli. 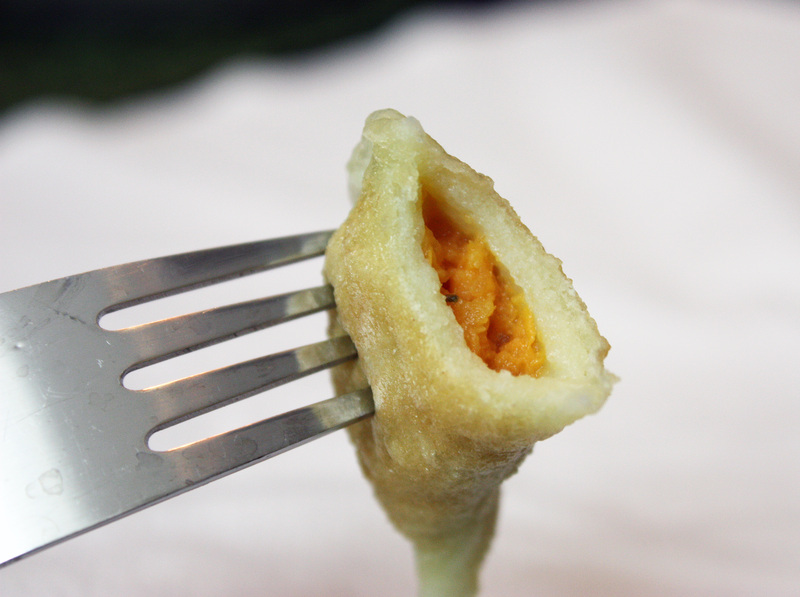 But these ravioli weren’t just “normal” ravioli – inside each of these babies laid an entire, unbroken, sunny egg yolk. In my opinion, these were the ultimate way to celebrate the intense yellow yolks the Jacob’s Reward Farm chickens created. The flavor of these ravioli was tasty and rich, especially as they were topped with a white truffle butter sauce. However, I did learn that rolling out pasta by hand is hard – and I ended up leaving the pasta sheets too thick, which resulted in heavy, dense ravioli. Not a perfect dish, but I would definitely try again, using a pasta machine to ensure thin, light pasta. (note to self: put pasta machine on wish list!) These were served with sauteed swiss chard, which was delightful. Mix ricotta, 2 egg yolks, nutmeg, parmesan cheese, and pepper in a small bowl. Refrigerate until needed. Put the dry ingredients into the bowl of a stand mixer. Blend using the paddle. In a separate bowl, lightly beat together the 4 eggs and oil. While the mixer is on, slowly add eggs/oil mixture to dry ingredients. Beat on medium speed for about 2 minutes. Dough will be soft like play dough. If it’s not, add water, one tablespoon at a time. Lightly dust your counter with cornstarch. Cut the dough into 8 pieces and cover 7 with a tea towel or plastic wrap. Lightly dust a piece of dough with rice flour and flatten. Roll through the widest setting of the machine. Continue to roll it through, folding it in half each time and lightly dusting with rice flour if the dough is tacky. Do this until the dough begins to hold together and seems smooth. It may take 5 to 6 times. Then decrease the thickness one notch at a time and roll through until desired thickness is achieved. Cut out a 5-inch circle from parchment paper (or use another tool to measure a 5-inch circle – I used my tart pans), and cut out 16 5-inch circles from pasta dough. Place the ricotta mixture in a pastry bag (or do as I did, place it in a quart-size ziploc bag, and snip a corner off of the bag). In the center of eight of the pasta circles, make a circle with your pastry bag/ziploc bag full of the ricotta mixture, leaving about 3/4 inch from the edge of the pasta, as if you’re creating a nest. Place an egg yolk in the center of your ricotta “nest”. Brush the edges with egg wash. Top with another pasta circle, pressing together to seal the edges. (You can use a pastry wheel or the tines of a fork to seal the edges as well.) Place pasta on a cookie sheet. If layering the pasta, dust it with rice flour. Cover and refrigerate until ready to cook. To prepare the butter truffle sauce, place the butter and truffle oil in a small saucepan. Bring to medium heat, stirring, until bubbling. Reduce to low, and stir occasionally. To cook the ravioli, bring a large pot of water to a boil. Add a dash of salt. Using a slotted spoon, carefully slide into boiling water. Cook until al dente. 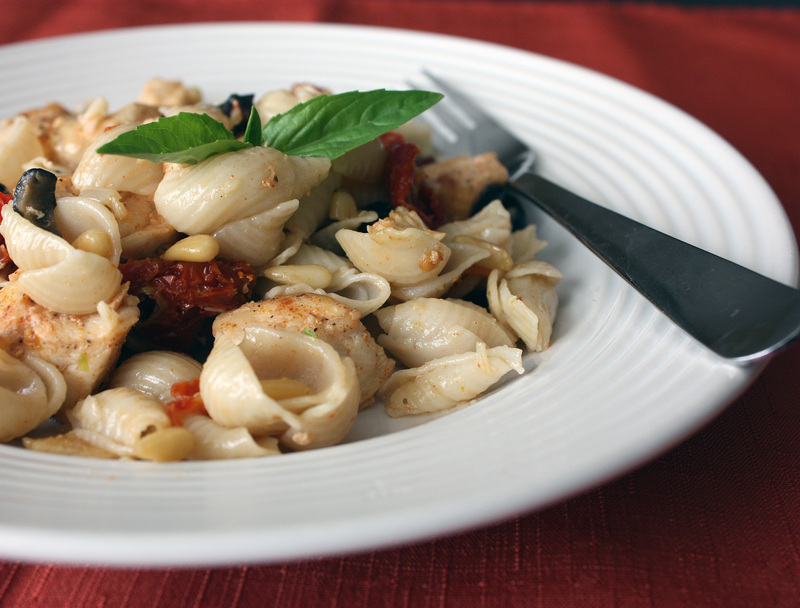 Fresh pasta cooks in just a few minutes. When the raviolis are done, drain and rinse it under hot water. To serve, place two raviolis on a plate, and lightly drizzle with butter truffle sauce. Serves 4. Of course, no “Egg-Stravaganza” would be complete without a dessert. But after the rich ravioli, a light dessert was in order. We enjoyed a pavlova – a lovely light-as-air meringue dessert that is popular in New Zealand. Pavlova has a meringue base, topped with whipped cream, and typically decorated with summer berries and kiwi. Since it’s not berry season, I opted to top it with pear slices, figs, banana, and clementines. It was very likely the best part of the meal – a lightly sweet, fresh, and airy finish to a wonderful evening. Preheat oven to 350 degrees. Line a baking sheet with parchment paper, then trace a 10-inch circle on the paper. Put egg whites and salt in clean bowl of a stand mixer fitted with a whisk, and beat on medium-low until frothy. Increase speed to medium-high and beat until egg whites form stiff but not dry peaks. Gradually add 1 cup sugar while whisking, then increase speed to high and beat until stiff and glossy. Sprinkle cornstarch, vinegar, and vanilla over egg whites, then gently fold in. Fill traced circle with meringue, smoothing top and sides. Put meringue in middle of oven and reduce heat to 300 degrees. Bake for 1 hour. Turn oven off and leave meringue inside until completely cool, 3-4 hours. Remove paper and place meringue on a cake plate. Whip cream and remaining sugar to soft peaks, then pile on top of meringue. Arrange cut fruit over whipped cream, and drizzle with honey. Slice into wedges to serve.